Mountain Lake Wilderness is one of the more popular wilderness areas in Virginia, and I would guess that the reason is a combination of the fact that it is near the main campus of Virginia Tech and it has some spectacular overlooks that can be accessed using relatively easy trails. I had been through here before, as part of a nearly 22 mile killer day hike back in December, 2013 (Link), where I concluded that this region is too far from my home to make for an enjoyable day hike experience. I had always wanted to get back here, though, because I wanted to enjoy some of the overlooks and also because I needed to hike a one mile portion of the A.T. that I believed I missed when I blew through here the first time. 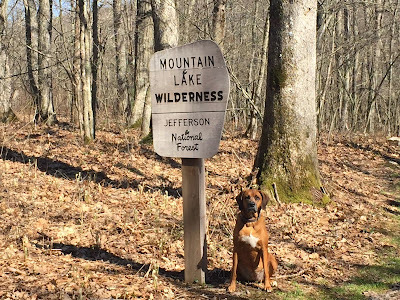 On my way back from a 3 day backpack in SW Virginia, I dropped by here to check off those boxes, and also to obtain the 10 wilderness miles required in this wilderness area for the Dirty Dozen Wilderness Hike Challenge - my eleventh completed wilderness. I had backpacked 9.6 miles on the A.T. over 4 hours earlier in the day, and was tired - mostly from the 17.3 mile backpack the day before. And I was sore, from tripping over the pencil-point end of a tree on the trail 24 hours earlier that still has the nail of my big toe an ugly purple as I write this four weeks later. But this wilderness was not that far out of the way of my return route so I decided to check it out near the end of the day. On the way to the trailhead, I was really impressed with the Mountain Lake Lodge, which I drove by. I thought it would be run down, but it looked like a pretty great place to stay with lots of interesting activities. I was less impressed with Mountain Lake itself, said to be one of only two natural lakes in Virginia. The lake itself looked about half full. I have since learned that this lake actually goes through cycles every 400 years where there is less water (Video) and the lake is "actually healing itself." The lake and the land around the lake is managed by a conservancy. A few miles past Mountain Lake I came to the trailhead for the War Spur Overlook. This is an easy loop trail that leads to a great overlook. This area is a big plateau, and I was on top of the table. 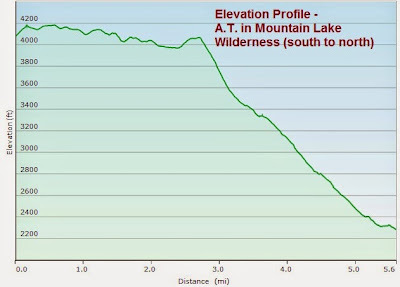 As you can see from the elevation profile below, the northbound A.T. goes over the plateau for several miles, then drops big time into the valley you look down into from the War Spur Overlook - going from 4067 to 2165 feet elevation over 3.4 miles, a descent of over 1900 feet! After descending steeply, the A.T. crosses War Spur Branch right at the War Spur Shelter, and exits the wilderness. The A.T. then climbs back up to nearly 3550 feet over the next 2.6 miles (outside of the wilderness), resulting in one of the larger elevation changes over any 6 mile sections of A.T. in Virginia. The War Spur Shelter, taken during a December, 2013 hike on the A.T. I wasn't about to try that again on this day, sticking instead to the top of the plateau. Don't think me a wimp - did I say I had already backpacked almost 27 miles over the previous couple of days? The War Spur Overlook is a pretty popular hike for Virginia Tech students, as it isn't too far from campus and it is a pretty easy hike with a spectacular payoff at the overlook. I ran into 6 or 8 students in my short time out here. The War Spur Overlook is on a side trail from the loop trail. In my research, the descriptions always said that it is well worth the side trip to experience this overlook. I think that goes without saying - why else would you be on this trail if you weren't interested in going to the overlook? The rest of the loop is in the woods and contains little to entice the hiker. The whole point of the loop is to get you, the hiker, out to the one rock that can give you the big views. The view north from the War Spur Overlook. After taking the Loop Trail and the War Spur Connector Trail (which linked this day's hikes with the A.T. through here that I had already completed), I drove up to where the Mountain Lake Road crossed the A.T. 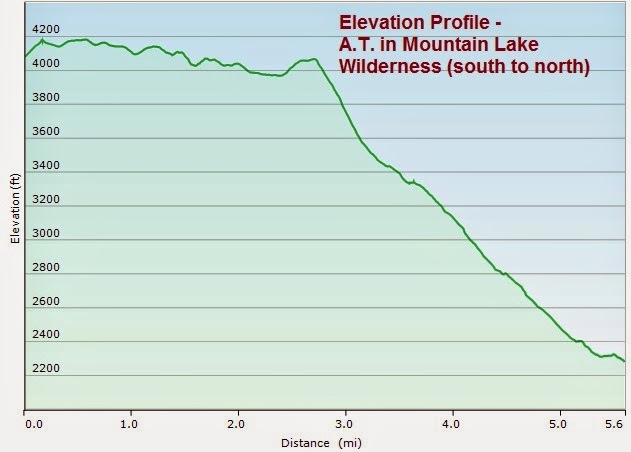 When I hiked this in December, 2013, I missed part of the A.T., taking the present Potts Mountain Trail instead. The PMT is the old AT alignment, and the new AT is not far off of the PMT, but I want to be accurate in my AT experience. I went back this day and covered the unhiked AT mile before connecting back with the PMT and continuing west. I hoped to make it to the White Rocks overlook, but I didn't have a map to confirm its distance, and chose to turn around about a half mile short because the sun was getting low on the horizon. This trail was easy to follow (though no longer blazed) as it is an old roadbed. Large field in the waning sun, on the Potts Mountain Trail. I walked past this site of an old lookout tower, and lamented how few of these artifacts are standing anymore. Site of the former Stony Creek Lookout Tower, 4128 feet elevation. Near the end of my hike I spent some time watching the sun heading low over the Wind Rock Overlook. This is a very easy walk from the Mountain Lake Road - only about 0.2 miles from parking and just off of both the A.T. and the Potts Mountain Trail at N37°24.857' W80° 31.166'. The views are spectacular - equaling many along this part of the A.T. that require much more work to obtain. Not to be missed! The sun sinks low from the Wind Rock overlook, looking west. Another view from Wind Rock, looking northwest. Is this all worth a special trip from Central Virginia? Probably not. But there are a lot of things to do in the area, so it can be a part of a weekend getaway. I think this is a really beautiful part of the state. Google Maps shows how to get to this area from Charlottesville - about 3 hours. Take Interstate 64 west towards Staunton, then turn south on Interstate 81. Stay on I-81 to the Blacksburg (Virginia Tech) exit, and take U.S. 460 past Blacksburg, Exit 118B. Follow US 460 for 18 miles west past Blacksburg/Virginia Tech. Pass the small town of Newport, then take right on Rt. 700, Mountain Lake Road. Follow Rt. 700 past the Mountain Lake Lodge, past the UVA Mountain Lake Biological Station, to either a parking area for the War Spur Loop or (a little further down the road) the A.T. road crossing. Both parking areas are well marked by Forest Service signs. Like what you see? Check out my other blog postings! LINK, and scroll down for earlier posts.